The CRS can serve four ripening rooms or 40 (or more! ), with continuous ethylene production to initiate the natural ripening & degreening process, while giving you complete control. Thanks to our CRS®, multiple systems can work together to provide ethylene for your entire ripening facility. Imagine supplying an entire packinghouse with ethylene from one central location….with complete confidence in your equipment and without fear of explosions. That’s how easy it is when you trust Catalytic Generator Australia’s safe, easy & convenient ethylene source. These systems have been installed across the world since 1998, and will be happy to provide a custom quotation based on the layout of your ripening facilities. Contact us and we can discuss how easy it is to make your ripening operation safer, more efficient and easier to manage with the CRS. Our Ethy-Gen® II Ripening Concentrate is a visible liquid, making it easy to inventory and re-order accordingly. In the past, you would have to weigh the cylinder in order to know how much ethylene you had received and how much you had left. Let Catalytic Generators Australia take the guesswork out of ethylene ripening. Try our CRS® and change the way you ripen. Our CRS® is far easier to maintain than other generator systems. The large supply of Ethy-Gen® II that connects to the system will last 5 times longer than a G-sized cylinder of ethylene, saving you valuable time, as well as money on shipping. Our quick-disconnect fittings and palletized containers of Ethy-Gen® II make it easy to swap out containers. Bulky cylinders and awkward lecture tubes can make the ripening process difficult and even dangerous, but with the CRS®, all you need is a pallet jack to move containers into place at the CRS® Pumping Station. With our system, ethylene is made right inside the ripening room, versus transmitted by pipe into each individual room. Simply switch on the ethylene in each room, and adjustments to the levels are made. Never worry about wasted ethylene dissipating in your pipes again. 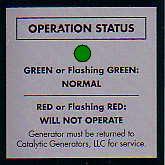 All of the generators provided by Catalytic Generators Australia provide an indication of correct operation. Our CRS® Pumping Station also monitors for correct flow of Ethy-Gen® II, and even lights up red when you’ve run out, keeping your supply current. Our knowledgeable staff is happy to install your new CRS® to ensure that everything is set up correctly and integrated properly. We usually complete installation within one day, but depending upon the size of your facility, we may require an additional day. Our installation process includes an in-room analysis to match your needs with the appropriate ethylene production system. We’ve been doing this for 40 years, and take the ripening business seriously. High quality, continuous duty pump provides a constant supply of Ethy-Gen® II Ripening Concentrate to all generators, as well as individual rooms upon demand. A high quality, electronic and state-of-the-art flow detection device which is sensitive to changes in the flow of Ethy-Gen® II Ripening Concentrate in the return line of the CRS®. In the event of a leak, the Control Station will shut off the CRS® pump, stop the flow of Ethy-Gen® II and turn on a bright red indicator light. Other options are available for employee notification, such as an audible alarm or a phone call. -Our Control Station offers you complete control – turn the CRS® on and off whenever you please. -Our Low-Flow Detector will sense when your supply of Ethy-Gen® II runs out, shut off the pump and illuminate the indicator light, extending the life of your pump. -Our Time Delay feature will override the flow detector, allowing the pump to prime, in the event of a power outage or a change in the Ethy-Gen® II containers. This optional feature easily and safely encloses two 55-gallon (208 liter) containers of Ethy-Gen® II Ripening Concentrate, and can be incorporated into the Pumping Station. 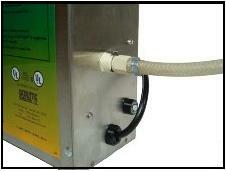 The CRS® pump can be wall-mounted outside the cabinet and tubing channeled through a hole in the cabinet. This compact and efficient setup takes up less space than two pallets. 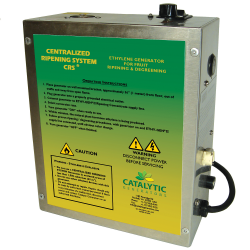 Our CRS® Generator provides continuous, consistent ethylene production for superior ripening and degreening. It adapts to any ethylene requirement. Wall mounted and narrow, the CRS® does not take up much space in the ripening room. Connecting to the supply line is easy thanks to the “Quick Disconnect” fittings on the inside of the generator. Available with TÜV (TÜV SÜV) and CE Conformity to 73/23/CEE and 89/336/EEC.